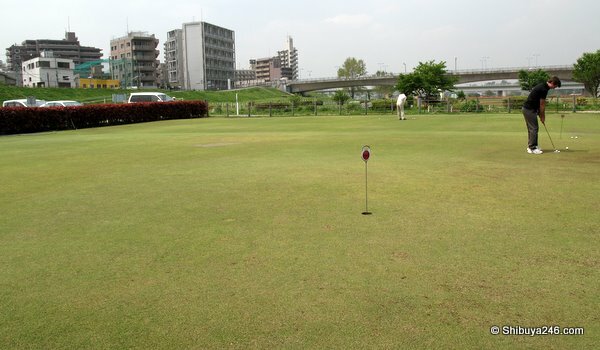 I tried out a new golf driving range the other day on the banks of the Tamagawa River (多摩川) near Futagotamagawa. 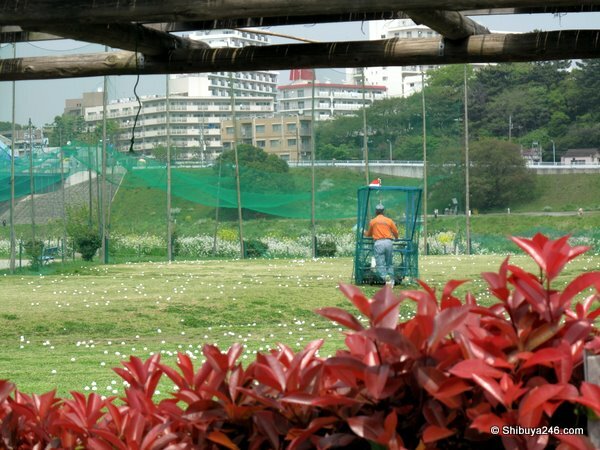 I normally visit the Kasai Lotte Range but wanted to get the feel more of being on the course than hitting with mechanical machines from a covered range. The first thing that surprised me as this range was the number of people out there on a weekday. The place was pretty packed and I had to go all the way to the end booth to have a hit. This range was certainly not what I was used to at Kasai. Normally if I go to Kasai at night I see many couples who look like they have just walked out of a Ginza club and come for a hit. 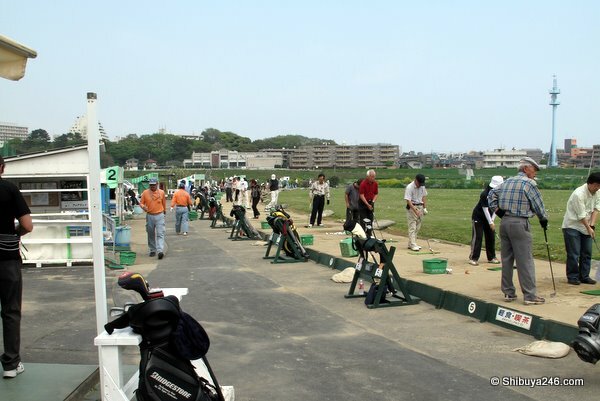 Down here at Marukobashi Golf Range there were a lot more older men by themselves, probably wishing they were heading down to a Ginza club later. There were various tents set up for checking in depending on whether you were putting or chipping etc. The ground was quite bare and the mats weren’t the best quality, but the atmosphere was just right. You felt like you were hitting out onto a fairway of a Japanese course, and with the river on one side and the Shinkansen rolling over the bridge at 5 minute intervals the scene was quite picturesque. Most Japanese ranges have automatic ball dispensers. This range was much more basic with no such equipment. It had a lot of charm though. If you are a train fan here are some more shots, without the golf. They had putting green facilities as well as a small space to chip and practice bunker shots. Chipping was off mats though so it is hard to say what benefit that practice might bring. 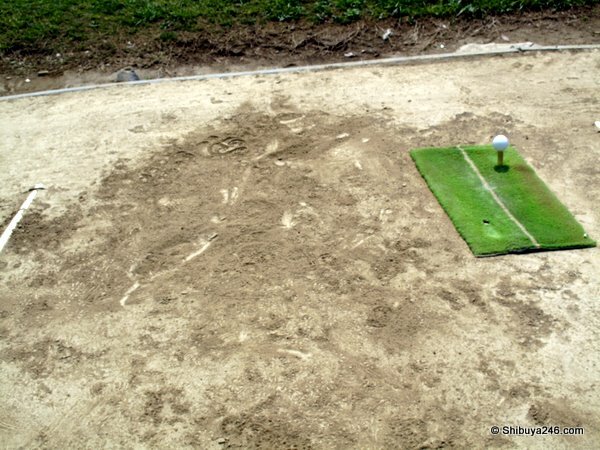 Most Japanese ranges don’t have the space for putting practice and if they do it is normally on artificial grass. 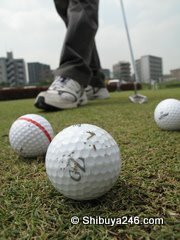 When you play golf in Japan you often see everyone practicing their putting madly before they play for the day. It is often the only chance they get to practice it. The highlight of the range is probably watching the trains go by directly on the path you are hitting. I would guess you need a very long hit to get close to the distance of the bridge and if you wanted to hit the train you would need a lot of elevation as well. 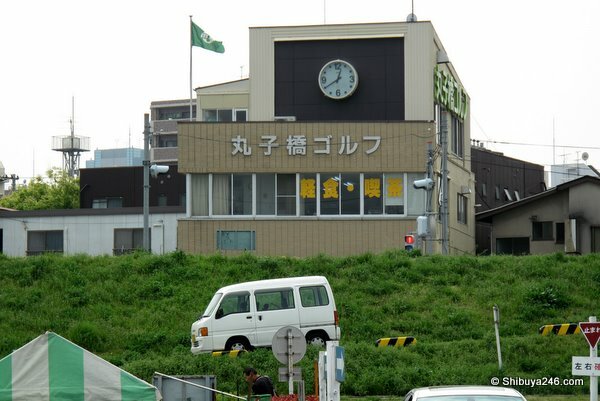 Basically, its not possible, but the image of hitting to the train was a good one. 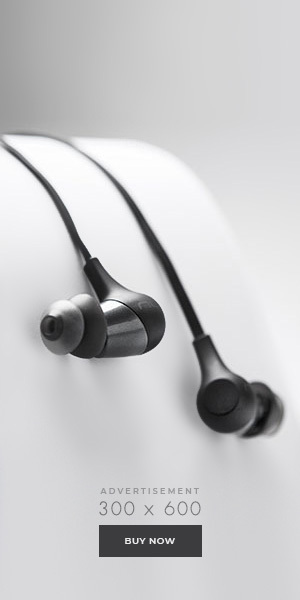 If you are planning to visit, here is the website (Japanese only). It shows the approximate waiting time on the website also. 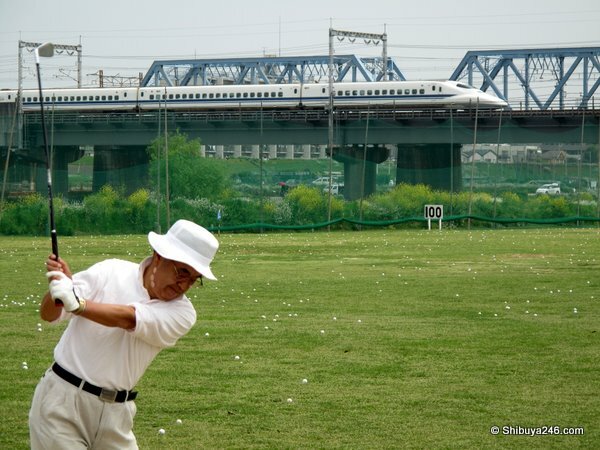 So do you think Tiger Woods might be able to hit the train?